"In his hands he held the instrument they had been hearing. To Oliver, it first looked like a scythe with a very twisted handle, but then he saw the strings. Running along an almost invisible track at the top of the scythes blade were several round black pins that were connected to hair-thin strings. The strings stretched from the top of the scythe down into the curved handle. It almost looked like a kind of harp, but its shape was too menacing. The gleam of the cutting edge of the scythe was too sharp to think of the instrument as anything but a weapon. The blade was polished and bright. It reflected the room back on itself, as well as the strings laid over it. The curving handle was some kind of lacquered plum colored wood with silver designs swirling around its surface. At the top of the scythe, sticking out of the side opposite the blade, was a single metal birds wing; fully extended so that each meticulously detailed feather could be seen." 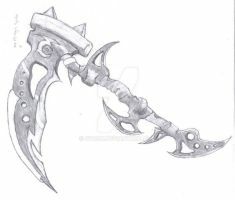 I love the concept of these scythe, I draw many types of weapons. I have drawn many scythes, I really love this. I love the colors and all the little details. And the strings. I love how it's also a harp. I really love the idea behind it as well. Beautiful! I love your idea. Dante? As in... Dante's Inferno? I must say, its incredibly useless in combat with strings in the way, it would be better to have the strings in the bottom's recurve. Oh my gosh...it's soooooo beautiful!!!! beautiful weapon with a wonderful description. that is SO something I would play!!!! love it!!! I wonder if it could ever be made into a real playable instrument? That would be sooo cool!!! Also love the story!! Are you doing NaNoWriMo this year too?? This is so awesome. I'm gonna favorite it. Very detailed and original. ^^ And epic. It's an interesting concept and in fact the strings, if thin and strong enough, could be left out and still prove quite nasty in terms of combat. My only issue is that if you decide to rework you make the handle's curve more fluent and less curved by the bottom and tilt the scythe head more so it looks like if it were swung it would catch more of what it was swung at on the blade instead of missing the intended target, as it seems to be with it's current curvature. A musical weapon to die for, quite literally is you use it the right way. The detail is great as well. This is freaking amazing! i too am writing a novel, but my Scythe didn't come nearly as amazing as that! i`ve seen lot of scythes, but no one like this one dude. This is simply beautiful. I love both the design and the idea behind it. Wonderfully well-thought-out and drawn. wow, now that really brings the idea of an "instrument of death" to life! ;D very creative, shows the inspiration that can come form reading. it's a very odd coincidence for me also. I am writing a narrative right now and the main character is Dante. one of the villains has a scythe as a weapon..so yeah. anyway, this is a beautiful scythe, i don't suppose it's used as a weapon? Yes, it's used as a weapon. This is just a beautiful concept. It's drawn well and the little story bit is fascinating. I almost kind of want to play with it, but bah. Hah, funny I should come across Dante's Stringed Scythe, my name is Dante. Anyways, I love the way you've done this one, it doesn't look like a scythe you could ever use, but it sure looks good nonetheless. Definate fav, keep it up. *gawks* You make me jealous. I wish I could draw a scythe that well. Of course, then the black and white thing would be an issue to me, because I still don't have any coloring tools. thats is freakin awesome. i love super weird weapons. Fantastic idea for an instrument - whether of war or music. Can't imagine it wouldn't be slightly unweidly, though. Nevertheless, gorgeous picture, love the linework and colour scheme. Nice. When it said Dante, I couldn't help thinking of DMC. Yet this weapon is good enough to look awesome in anyone's hands. I want one! This is a wonderful design! The sliding strings just fascinate me... how are they locked in place? There's a track in the handle that they're attached to. When not being played, the user pulls on the farthest string, and they all kinf of collapse together and lock away inside the staff section of the scythe. Saw the link to this on Nanowrimo. I love the design, very original.